Visual Paradigm Wins 15th Annual Jolt Product Excellence Award! 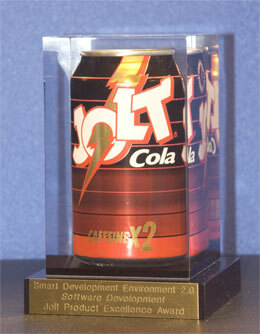 Visual Paradigm International was awarded Software Development Magazine's 15th Annual Jolt Product Excellence Award for its visual modeling application software, Smart Development Environment (SDE). Visual Paradigm International wins the Jolt Winner in the Design Tools category, over the other finalists including IBM Rational Software Architect, Borland's Together Designer and No Magic's MagicDraw UML. SDE was awarded by a team of Software Development editors, columnists and industry gurus who felt that SDE 'jolted' the industry by creating a software product that is faster, easier and more efficient. These awards were announced on March 16 at SD West 2005 in Santa Clara, California. SDE is a UML modeling extension for leading IDEs including Visual Studio®, Eclipse/WebSphere®, Borland JBuilder®, NetBeans/Sun™ ONE, IntelliJ IDEA™, Oracle JDeveloper, BEA WebLogic Workshop™. SDE provides an intuitive visual modeling environment for developers to perform requirement capturing, analysis and design with UML. SDE also automates tedious tasks such as transforming design to implementation, keeping the technical documentation up-to-date (code to model synchronization) and advanced reverse engineering.